Cheesecake recipes are simple to make. But, they're also easy to mess up by mixing or baking them the wrong way. I'm going to give you some tips for creating a perfect cheesecake recipe that will wow your family and friends; they'll think you bought it at a bakery! I have always had great success with a New York style cheesecake with a graham cracker crust, but I've made other styles and flavors that have turned out well. For the ones I make for myself, I almost always use the graham crust; I just prefer it to any other. I remember the first cheesecake I ever made many years ago was a Greek honey cheesecake; I was sure that it wouldn't turn out right, but it was extremely good, and looked great, too. They're my favorite kind of cake and that first one gave me the confidence to branch out and try different ones. Easy cheesecake recipes can be found in many cookbooks. Start with one that you'll like the flavor of and has simple instructions and ingredients. After a couple of easy cheesecake recipes you'll be ready for some different flavored ones that are more complicated. There are different kinds of cheesecake-cream cheese or curd style; ricotta cheesecake recipes are a popular creamy style. 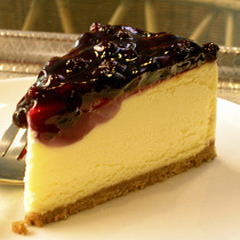 Cheesecakes can also be made with or without a crust. Crumb crusts can be made with cookie crumbs or graham cracker crumbs; just about any flavor of crumbs can be used. The filling of cheesecake can be flavored with many different things, including fruit purees, chocolate, white chocolate and liquors. There are also any number of different toppings that can be put on a cheesecake; cherries or sour cream are two of the most common. The combinations of crusts, toppings and fillings that you can put together are endless! When doing a crumb crust you can put crumbs over the whole pan, just up the sides or just in the bottom. When you have a crumb crust, bake it in the oven at 450 degrees for five minutes, and then let it cool before filling with the cheese cake mixture. Baking the crumbs before filling helps to keep them from getting soggy. Make sure the cream cheese is at room temperature; this will help it incorporate into the batter more smoothly and prevent lumps. Scrape the beaters and sides of the bowl frequently while mixing your to ensure that the stiff cream cheese on the beaters and bowl get mixed into the batter. Mix the batter well, but don't overbeat. If you beat too much air into the batter it will puff up when baking and then collapse. Don't use a food processor to mix cheesecake batter; it will make the batter thin and dense and it won't rise in the oven like it should. For pretty swirled cheesecake recipes, use a tart fruit puree or melted chocolate. Put one-third of the batter in the pan and then drizzle one-half of the chocolate or pureed fruit mixture over that. Repeat with the remaining batter and fruit puree or chocolate, ending with the batter. Then, using a knife, cut through the batter to make swirls in it. Cheesecake is really more of a custard than a cake, so crustless cheesecakes bake well in a water bath. To do a water bath, Grease the springform pan and line the bottom with waxed paper. Then, wrap a double layer of foil around the outside of the pan so that none of the batter seeps out. Put the springform pan in a larger pan that doesn't touch the sides of the springform pan. Put two to three inches of water in the larger pan. Cheesecake recipes can also be baked with the New York cheesecake recipes method. Bake the cake at 500 degrees for 15 minutes, then turn the oven down to 200 degrees and bake about one more hour. When the cake is done baking, turn the oven off, but leave the cake in it. Put a wooden spoon in the oven door so that it's open a little bit, and leave the cake in the oven to cool for one hour. 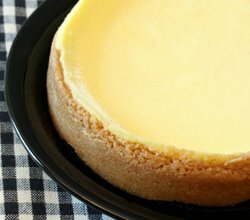 Cheesecake recipes have to be baked at a low temperature, for the right amount of time, or they will crack on the top or overbake around the edges. Over mixing can also cause cracking and shrinking, as can cooling the cake too fast. The cake should still jiggle in the center when it comes out of the oven; it won't set up completely until it's well chilled. Unmolding a cheesecake can be tricky. Wrapping a hot, damp towel around the pan or placing it on a heat source for 10 seconds will usually help release it from the pan. Also, try sliding a long, metal spatula with a thin blade between the cake and the pan to release it. Cheesecakes are better if they're chilled for at least 24 hours before serving. This improves the taste and density of the cake. Store cheesecake covered, in the refrigerator. Take them out about one hour before serving to soften and bring out the flavors.